Smartz first hit the Internet in September 2004. This was the same year that Batman breached security at Buckingham Palace (How Funny was that !! ), and SpaceShipOne flew into space to claim the X-Prize !!! Before Smartz, thesmartclub started in 2000, and Funkysmart in 2002. TheRoadster.net was started in April 2004 by smartroad (Kelvin). Evilution.co.uk started in May 2004. There were also a few Yahoo Group based Smart Message Boards and some regional smart clubs, like sussexsmarts. Matt's idea for the website came about from him searching the web and finding lots of similar web-sites but without the kind of in depth articles which he so love to read. So Matt decided to take it on himself and create a friendly warm environment for Smart Car Owners to come have a nosey and drop their thoughts down. Smart Part Chick (Chrissi) was the Smartz site sponsor at that time. In October 2004, the New Forum was born, based on WoWbb. Matt was Banned from Funkysmart on 28th October 2004, Which caused a bit of a Stir !! Ah, the good old day's eh !!! In November 2004, Smartz started the SMARTZEE membership, with MARKANDTR being our first SMARTZEE Member. These members could donate and become a member of the site, giving access to the VIP Area, and receiving the hallowed Smartz Sticker, from Captain Sticker - AndyM !!! In December 2004, Smartz was all dressed up for Christmas .... and looked like this !!! ... How Many remember this ?? With Smartz Membership rising in 2005, and Posting the most up to date smart news, still running on WoWbb and in February 2005, Smartbil became Smartz's Site Sponsor. April 2005 saw www.smartmania.co.uk site on-line. 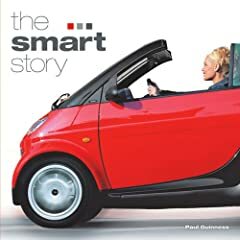 In May 2005 The Smart Story by Paul Guinness was published. July 2005, thesmartclub.co.uk moved from Ezboard, to the Vbulletin Platform. In September 2005, at a large expense, The VBulletin version of Smartz was launched. Esqulax and Matt moved all the posts and Items from the old WoWbb board onto the new database, and although a few Server problems got in the way ... Smartz was now on a far more stable Forum Platform, and the same software as most of the other smart fora. Also in September 2005 saw FunkySmart Close, and Smartmaniacs.co.uk start, with the Funkysmart database, and Users. Late in December 2005, LucidSmart was brought on board to assist with the maintenance of the Forum software. This was quite timely, due to many issues with the site after a problematic upgrade that had seen Smartz loose it's Front page and Gallery. Lucid got it all back to normal by Feb 2006, well as normal as Smartz ever could be !! In February 2006, we achieved our 1000th Member, who was ETK55. We also had BIG Performance join as our new Site Sponsor. In April 2006, Forfourowner.com was started by ICY and Sarah . In June 2006, McSmarts also became a Site Sponsor too. September 2006 saw Smartzstock in the Lake District. Puddlejumper organised a great weekend, Smartz's first Grand Meet which will hopefully carry on for many years. The First meet being memorable for many things, not least the Snoring, and Benny rolling his Roadster !! There was also some rather fine Kareoke too ... which helped the fundraising reach just short of £200 for our nominated Charity, the PDSA. In November 2006, the new version of Chat was released. The Chat facility has always been popular on Smartz, and the most used Chat of all the smart related sites. The Smartz Team developed the site over 2006, however in the face of a pretty useless ISP, and many people being unable to connect to the site because of a weird banning policy of the ISP, we decided to move the site to the new hosts. From February 2007, Smartz was moved to a server in the UK, and had a new colour-scheme to make the site distinctive, and a new Logo courtesy of HoagieKat. The Site was also upgrade to the latest versions of code to make more functionality available. In April 2007, Julie Saltmarsh (Polkadot) and Tom Crawford's (S2Trash) book, The Smart Scene was published. In July 2007, Wellsmart became a site advertiser, along with our existing advertisers, BIG Performance and McSmarts. In September 2007, the new smart car was launched in the UK, and many smart dealers had an open day event. Smartzstock 2007 was another success, with more people and cars than last year !! Memorable moments from 2007 included the appearance of Justin Lee Collins (otherwise known as smartRhino !!) and Annie and Fi's Breakfasts. Andy and Stevie's quiz also raised £150 for our nominated charity, Marie Curie Cancer Care. In October 2007, Smartz achieved it's 2000th Member, who was smartymart. Our Traffic profile, especially traffic from the US and Europe also increased over 2007. If you have any information to add to this feature, please PM LucidSmart2005 with the details ! !